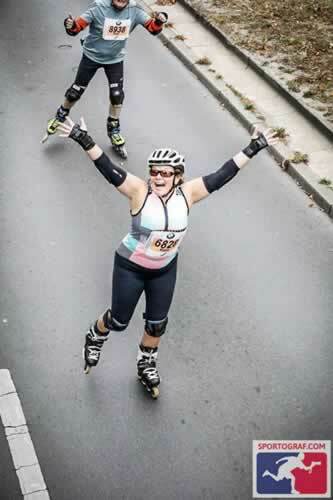 Saturday 15th September was a big high; I completed my first inline skating marathon in Berlin. I’ve been training solidly, using the Skatefresh Beginner and Intermediate “Skate for Fitness” Online video training courses. I wasn’t strong enough to use my new 3 x 110 skates over that distance so I stuck with the 4 x 80s and was worried I wouldn’t complete in the 2 hours 30 minutes necessary to avoid the “Bus of Shame”. But on the day it was FANTASTIC. A bit windy but very clear and sunny. 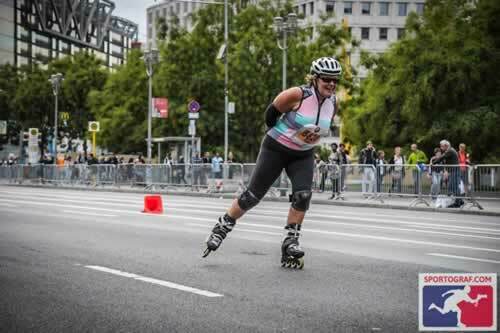 Berlin is a really beautiful skate – wide smooth streets and largely flat, with some wonderful historic sites. Lots of people came out to cheer, even on the further reaches of the track; very motivating! As a first timer I was in the last group out. I’d trained to stick to a steady pace, concentrating on an even stroke and recovery. It totally worked, as I focused on simply doing my own race, and not worrying if people passed me early on (or getting cocky if I passed others). At the halfway mark, I had a look at my watch – hadn’t wanted to spook myself out before that, and realised I was comfortably ahead of my necessary time. 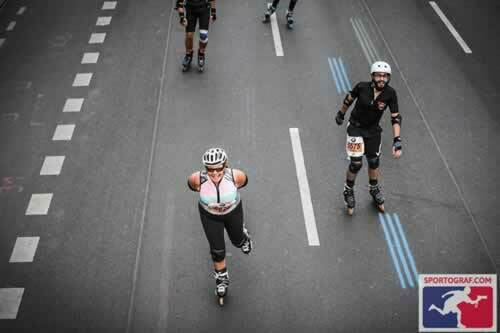 I stuck with my plan and when I got into the final stretch, with people cheering, and I could see the Brandenburg gate, I had the biggest surge of energy and just powered to the finish line. I felt SO triumphant. I finished in an AMAZINGLY fast time for me – fastest I’ve ever been. 2.08:16 on the chip and with a very even first and second half. Thrilled with the training, my plan and the course and how they all came together on the day in such a beautiful city with a great atmosphere. Now … can I do it on the 3 x 110s next time? Here’s some photos and a tiny video – check that centre edge. And the regroup. Really pleased although for sure I could get deeper in the knee and hip for the future.